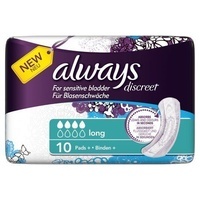 Always Discreet Small Pads+ for sensitive bladder have an “ultra” thin absorbent core that turns liquid into gel. So even though they are up to 40% thinner than to the leading brand*, they still absorb 2X more than you may need**. For occasional leakage when sneezing or coughing causing wetness. Helps lock away odour and wetness. Exclusive OdourLock™ technology that neutralizes odours instantly and continuously. Lightly scented. Thin and flexible, even when wet.